Featuring Over 3 1/2 Hours of Entertainment on a Two-Disc Set! BURBANK, CA (February 26, 2014) - The Man of Steel continues to conquer the world's villains with the release of New Adventures of Superman: Season 2 & 3 . This classic animated television series was produced by Filmation Studios and arrives on DVD on June 3, 2014, for $19.97 SRP. 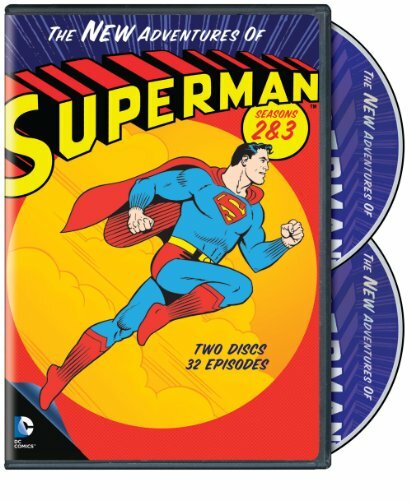 The New Adventures of Superman Seasons 2 & 3 features 32 action-packed family friendly episodes and is not to be missed by fans. New Adventures of Superman: Season 2 & 3 depicted the first time that Superman; his alter ego, Clark Kent; award-winning journalist Lois Lane; and Perry White, Editor-in-Chief of the Metropolis newspaper The Daily Planet, had been seen in animated form since they were immortalized in the iconic Superman short films of the 1940s. In addition, this series marked the animation debut of photo journalist Jimmy Olsen, as well as classic Superman villains such as archenemies Lex Luthor and Brainiac. "New Adventures of Superman: Season 2 & 3 is a thrilling set for DC Comic fans," said Mary Ellen Thomas, Warner Bros. Home Entertainment Vice President, Family & Animation and Partner Brands Marketing. "We are proud to add this set to our extensive legacy of classic content featuring the Man of Steel and his epic challenges to maintain peace on Earth." Warner Bros. Home Entertainment (WBHE) brings together Warner Bros. Entertainment's home video, digital distribution and interactive entertainment businesses in order to maximize current and next-generation distribution scenarios. An industry leader since its inception, WBHE oversees the global distribution of content through packaged goods (Blu-ray Disc(TM) and DVD) and digital media in the form of electronic sell-through and video-on-demand via cable, satellite, online and mobile channels, and is a significant developer and publisher for console and online video game titles worldwide. WBHE distributes its product through third party retail partners and licensees, as well as directly to consumers through WBShop.com and WB Ultra.